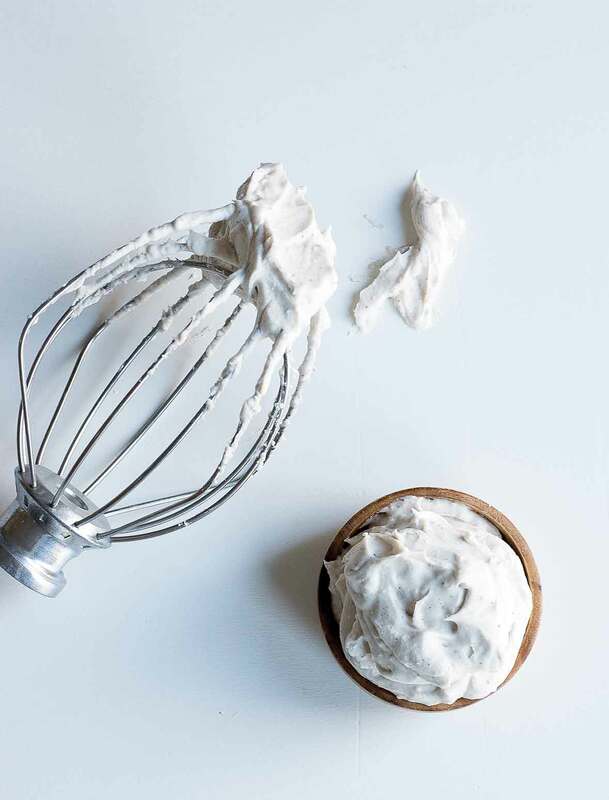 Knowing how to make coconut whipped cream from coconut milk is a trick that’s easy, paleo, dairy free, and oh so insanely satisfying. In order to achieve this spectacularly luscious coconut whipped cream, you simply cannot use low-fat coconut milk. It just won’t work. So if you remember nothing else while you’re standing there at the grocery store, contemplating the various cans of coconut milk, remember to get the full-fat version. Beyond that, there’s still quite a lot of variability among brands of canned coconut milk and their performance when being whipped into cream. We mention the two brands we felt worked best in this recipe in the ingredient list. You can instead opt to use canned coconut cream, which is available at Trader Joe’s as well as most Asian markets, which saves you a little fuss and offers a slightly greater yield. Ideally you want a coconut milk or cream that doesn’t contain any other ingredients, such as stabilizers like guar gum. 1. First, do not shake the can of coconut milk for several days before making this coconut whipped cream. Also, make certain that you didn’t inadvertently purchase low-fat coconut milk as that simply won’t work. Make certain the coconut milk has been stashed in the fridge for at least 24 hours. 3. Add the maple syrup to the bowl and then, using the tip of a sharp knife, scrape the seeds from the vanilla bean into the bowl. 4. If using a handheld mixer, beat the ingredients, starting at a slow speed and gradually increasing until you’re on the highest setting. It should take 2 to 4 minutes until the coconut whipped cream holds soft, billowy peaks and you can tell more whipping isn’t going to make it any thicker. If using a stand mixer, use the whisk attachment and beat the ingredients, starting at a slow speed and gradually increasing until you’re on the highest setting. It should take 2 to 4 minutes of whipping until the coconut whipped cream holds soft, billowy peaks and you can tell more whipping isn’t going to make it any thicker. If you want to make a chocolate frosting from this cream, just add about 1/4 cup (25 grams) cocoa powder with the rest of the ingredients. To add creaminess to savory dishes, including pureed soups, make this coconut whipped cream plain. Just omit the vanilla beans and maple syrup. These instructions for how to make coconut whipped cream created a beautiful “whipped cream” that was perfect with a bowl of fresh blueberries. The maple syrup and vanilla added a lovely note to the rich coconut. I used the whisk attachment of my handheld blender to achieve that creamy texture. 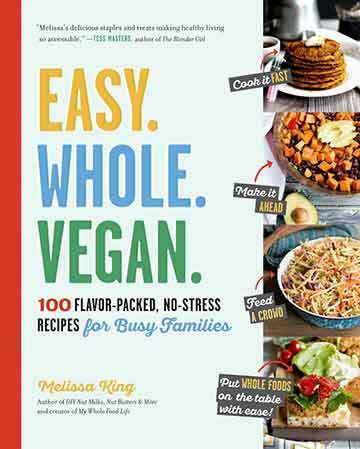 As the author suggests, it’s best eaten right away, though it still tastes great the next day. It only took 2 minutes to get to the right consistency using a handheld blender as opposed to a stand mixer. The next day, the coconut whipped cream did harden as the author warns. Coconut whipped cream is a wonderful treat and is a great option for friends and family who do not eat dairy. The maple and fresh vanilla add great flavor. Our cream whipped up fluffy and smooth. We served the cream with cookies—scoop, munch, and yum. We will try the cocoa version next, perhaps with angel food cake. Brands of coconut milk vary widely. We used the Whole Foods brand for this test and it was fine though not pure white. If you hope for close-to-pure white fluff flecked with vanilla, use the recommended brand, Thai Kitchen Organic. This non-dairy version of whipped cream is a great recipe to put in your back pocket for when you’re looking for dessert options for your dairy-allergic or vegan friends. For my test, I used a grocery store brand of coconut milk. About 70% of the can solidified during refrigeration, and that's what got whipped in the stand mixer. The ideal whipping time might vary depending upon your mixer, but for me it was about 1 minute. I kept whipping for 4 minutes, and felt that it was a little too soft after that amount of time. Be aware that the maple syrup will make your whipped cream a little bit beige. You could use another sweetener if that bothers you. I used vanilla powder (which is light in color) instead of vanilla beans which are dark and will make for a speckled result. The author says this is best used fresh, and while that is true, I wanted to see what happened if it was kept in the fridge. A few hours really made no difference in the product. After 24 hours, it was firmer and some very tiny bits of congealed fat were appearing. After 48 hours, there were larger pieces of congealed fat. I think you'd be perfectly safe making this a few hours ahead for a party. If you make it further ahead than that, you can just re-whip it in the mixer to get the texture back. I served this with fresh berries. Nice combo. Best: Chaokoh. It had not separated completely, and may accidentally been jostled, yet it still whipped up in a manner very much like heavy cream. It had the best flavor with minimal additives. It also was still nice after 4 days. Very Good: Trader Joe’s Coconut Cream. This looked most like I’d hoped when I opened the can—a thick layer of material with a smaller amount of milky translucent liquid below with the most cream. Poor: Thai Kitchen Organic. This just didn’t whip into a cream mass, but rather slightly granular, and not integrated or smooth at all. It also had a slightly odd flavor. Worst: Trader Joe’s [ordinary, full fat] Coconut Milk. Just awful. grainy, coconut cream had also fractionated a waxy disk which did not break down into anything creamy. The result was gritty, and while it had nice vanilla flavor, it was not worthy of the scraped beans. Very disappointing. I found that 1 tablespoon of maple syrup was plenty—taste before adding more. My Kitchen Aid stand mixer did not handle the small volume very well so I used my electric hand mixer. The topping was nice for a vegan chocolate cake or even pancakes (though the heat would make it want to melt) and could be fun it you wanted to make a watermelon cake with coconut icing. I think it was so nice with my crazy cocoa cake from an old Sunset cookbook that I would just stop right there. In my first attempt at this, the coconut cream had not separated from the coconut milk in the can. I tried it anyway and unsurprisingly it didn't work. My second can had separated a bit better but the coconut cream wasn't in a solid block as the recipe suggests it ought to be, but it still worked! And the coconut whipped cream kept its shape for 3 days in both the fridge and in a covered dish on the counter and didn't get stiff at all (maybe because it had more coconut water in it than it should have). The second time around I decreased the maple syrup to 1 tablespoon and liked both the flavor and color much better with the smaller amount. It was lighter than buttercream but just as tasty. I can see using this even if I was serving a dairy-eating crowd. If you're a fan of coconut, this recipe is for you. This coconut whipped cream is over-the-top delicious! Coconut is one of my absolute favorites and my go-to flavor for a dessert—ice cream, pies, cookies, cakes, if it has coconut in it, I am in! So naturally I was drawn to coconut whipped cream. This simple-as-can-be recipe will give you a nice hit of coconut in an unexpected place. It does have a distinct coconut flavor, so it's not a substitute for whipped cream. It will, however, add a dimension to anything it's paired with. The cream holds a softer peak than regular whipped cream, but it's just as rich and velvety and comes with the added bonus of having about 1/3 less fat and calories! I served the whipped cream with a decadent cup of hot chocolate made from LA Burdick Chocolate’s shaved milk chocolate. It was an amazing pairing that I couldn't get enough of. The cream melted and blended in and added a complexity and richness that regular whipped cream does not. My daughter said she liked it more than regular whipped cream and said it tasted like a dessert rather than a topping. This cream would send coconut cream pie over the edge or add another layer of flavor to key lime pie. It took me about 8 minutes to whip the coconut cream. I followed the directions and started off slow and increased to high. I stopped the mixer once to scrape down the bowl. It did not get stiff peaks but it does hold a soft peak nicely. Once whipped, the cream becomes firmer when refrigerated. A quick stir with a spoon makes it softer and can be spooned on as a topping. Coconut Whipped Cream Recipe © 2016 Melissa King. Photo © 2016 Heather Poire. All rights reserved. All recipes and photos used with permission of the publisher. Question. How do you think this would be on a basic carrot cake? Instead of a cream cheese frosting I would use this instead. Also, would it be overkill to fold in sweetened coconut to give it some texture, extra flavor, and make it look like a coconut cake? Jim, I like the way you’re thinking. Texture-wise, this is a much softer topping than a cream cheese frosting and so I’m not certain it would work to actually “frost” the cake as I worry it wouldn’t cling to the sides of the cake but rather just sorta slouch down off the sides. Also, if it’s a two-layer cake, I worry that the portion in between your cake layers would just sorta disappear and get absorbed by the cake. What if you didn’t frost the cake but instead served slices of cake already plated with a large dollop of the whipped cream? Because taste-wise I think it would be wonderful with carrot cake. As for folding in coconut, again, I don’t think the texture of the coconut cream would be strong enough to support the coconut although taste wise it could be quite nice, albeit quite sweet, since the coconut flavor of the whipped cream is actually relatively subtle. Again, though, you would need to u use it as a dollop rather than expect the whipped cream to serve as a frosting. Hope this helps. Let us know what you decide to try!